Alciato at Glasgow: Emblem: A Vertu, Fortune compaigne. Section: FORTUNE. View all emblems in this section. Avoir par tout des biens en affluence. fault en nul lieu, au sage bien parlant. 1. Amalthea was the she-goat that suckled the infant Jupiter. Her horn became the cornucopia, the horn of plenty. See Erasmus, Adagia 502, Copiae cornu. 2. This was the herald’s staff, attribute of Mercury, god of eloquence, intellectual pursuits and financial success. The entwined serpents are a symbol of peace. See Pliny Natural History 29.12.54. 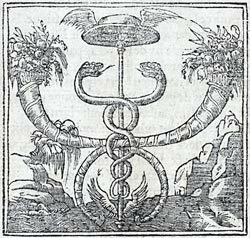 The caduceus was Alciato’s personal device and was carved on his tomb at Pavia.